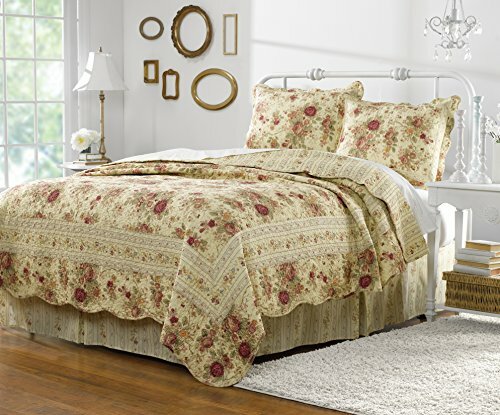 Surface texture and warm colors refine the look of this updated classic quilt set. The deep ecru fabric features garden roses in rich red and gold hues. Framed and reversed to a coordinating striped fabric. Finely stitched for durability and scalloped along the edges. 100% cotton. Oversized for better coverage on today’s deeper mattresses. Each quilt set includes 1 quilt and 2 standard sized shams (1 sham per Twin set). Sizes: Twin 72"x90", Full/Queen 92"x92", King 106"x96, Sham 20"x26"